Born Jul 9 18422,3,4,5 [Jul 9 18436,7, Jul - 18418], Miami County, Ohio2,3,4,5. He married America Hickman, Dec 21 1865, White County, Indiana.4,10,11 America was born about 1843, Ohio.2 Note that David's father's third wife was a Hickman (relationship unknown). Hinshaw, David, age 27, born in Ohio; farmer; $400 real estate; $200 personal property. Hinshaw, America [unclear], age 27, born in Ohio; keeping house. Hinshaw, Charles J., age 2, born in Indiana. Hinshaw, Infant, age 6 months, born Dec  in Indiana. Hinshaw, David, age 37, born in Ohio; parents born in Tennessee; farmer. Hinshaw, Sarah, wife, age 19, born in Indiana; father born in Ohio; keeping house. Hinshaw, Charley, son, age 12, born in Indiana; parents born in Ohio; attended school; "maimed, crippled, bedridden, or otherwise disabled". Hinshaw, Louisa, daughter, age 10, born in Indiana; parents born in Ohio; attended school. Hinshaw, John W., son, age 6, born in Indiana; parents born in Ohio; attended school. Haas, Joseph, brother-in-law, age 16, born in Indiana; parents born in Ohio; farm laborer; attended school. Dursse, Lizzie, servant, age 24, born in Ohio; parents born in Ohio; servant. Hinshaw, David, head-of-household, age 58, born July 1841 in Ohio; parents born in Tennessee; married 12 years; occupation: farmer; owned farm (free). Hinshaw, Mary C., wife, age 51, born June 1848 in Ohio; parents born in Ohio; married 12 years; 5 children, 4 living. Hinshaw, Richard [sic], head-of-household, age 66, born in Ohio; father born in Tennessee; mother born in Virginia; third marriage, married 22 years; occupation: farmer, general farm; owned farm (free). Hinshaw, Mary, wife, age 63, born in Ohio; parents born in Ohio; third marriage, married 22 years; 3 children, 2 living. Hinshaw, Rena, granddaughter, age 16, born in Indiana; parents born in Indiana; attended school. 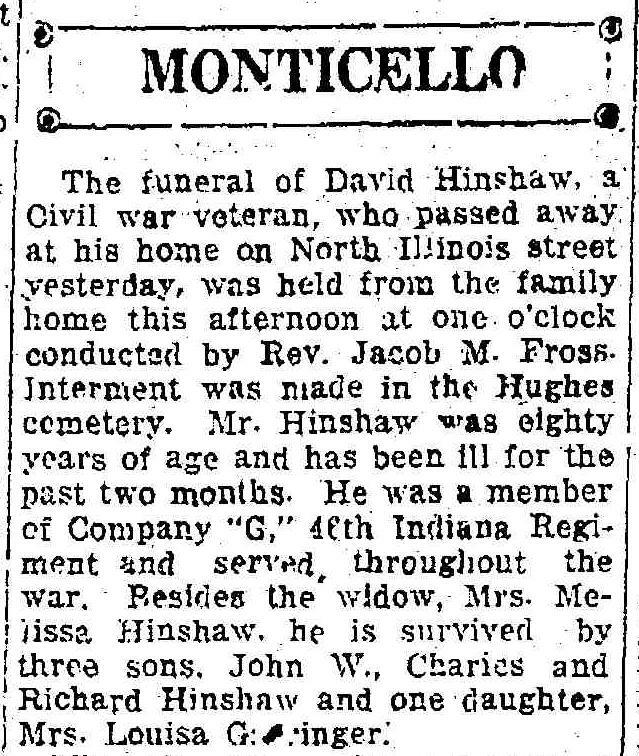 David's funeral was noted in the "Pharos-Tribune" (Logansport, Indiana) on Wednesday, December 27, 192218 (see scan below). 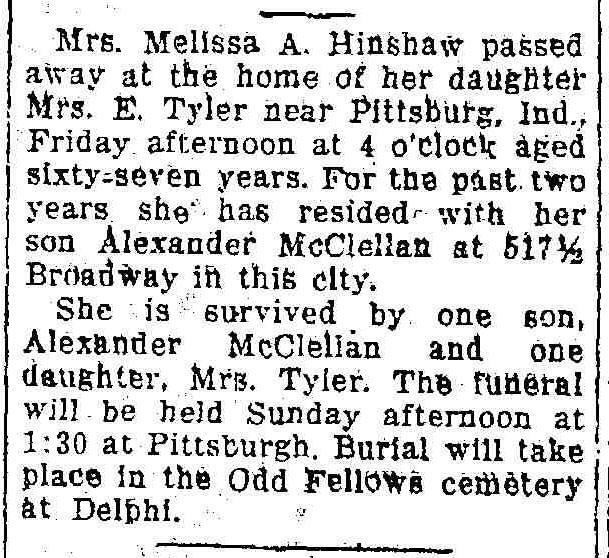 Malissa's death was noted in the "Pharos-Tribune" (Logansport, Indiana) on Saturday, July 17, 192619 (see scan below). 1870 census, Monticello P.O., Liberty Township, White County, Indiana; roll M593-373, page 220, line #29, dwelling #7, family #7. 1880 census, Liberty Township, White County, Indiana; roll T9-324, ED 178, page 223C, line #35, dwelling #60, family #60. Contribution from Ruth Hinshaw Ware. 1860 census, Buffalo P.O., Liberty Township, White County, Indiana; roll M653-307, page 596, line #1, dwelling #226, family #226. Indiana Marriage Records Index 1845-1920; Ancestry.com; book 17, pg 401. 1910 census, Liberty Township, White County, Indiana; roll T624-389, ED 213, page 69A, line #28, dwelling #60, family #60. 1900 census, Liberty Township, White County, Indiana; roll T623-413, ED 131, page 11A, line #34, dwelling #238, family #250. American Civil War Soldiers; http://www.ancestry.com. Marriage Index: Indiana, 1851-1900; White County, Indiana courthouse records, Monticello, Indiana (1380343). Indiana Marriage Collection, 1800-1941; http://www.ancestry.com. Civil War Pension Index: General Index to Pension Files, 1861-1934; http://www.ancestry.com. 1900 census, Liberty Township, White County, Indiana; roll T623-413, ED 131, page 11A, line #36, dwelling #239, family #251. 1900 census, Liberty Township, White County, Indiana; roll T623-413, ED 131, page 11A, line #38, dwelling #240, family #252. 1910 census, Liberty Township, White County, Indiana; roll T624-389, ED 213, page 69A, line #31, dwelling #61, family #61. 1910 census, Liberty Township, White County, Indiana; roll T624-389, ED 213, page 69A, line #39, dwelling #63, family #63. "Pharos-Tribune" (Logansport, Indiana), Wednesday, Dec 27 1922; http://www.ancestry.com. "Pharos-Tribune" (Logansport, Indiana), Saturday, Jul 17 1926; http://www.ancestry.com.